1978 Reliant Scimitar GTE - I wrote about this car back in April, 2009, but it's back on eBay and worth featuring again. This is a really neat car and one that has a cult following in the UK. It was never sold in North America. You can find my earlier post here. It contains 5 really good Scimitar links. This car is located in Staten Island, NY. Click here to see the eBay listing. 1973 BMW Bavaria - I've always like the Bavaria. It's a big sedan with good performance. It's styling set the tone for future big BMWs. This 1973 Bavaria appears to be a well maintained, nice, driver. It's had a few modifications done to it, all of which appear to be done well and are of the beneficial variety, not the "Hey, look at me" variety. Older BMWs rusted big time. This car was repainted at one time and has had a fender replaced. There are a few rust bubbles showing. It would be very worthwhile to do a thorough examination of the body to check for hidden / poorly repaired rust before buying it. This is a cool old BMW you could drive every day. Located in Franklin Lakes, NJ, click here to see the eBay listing. 1992 550 HP E36 BMW (!!) - As I've written before, I'm not a big fan of engine swaps. Still, some are some are so well done and / or are so insane that I can't help but admire them. Like the Austin Healey Sprite with the Jaguar 6 in it that I pointed out last week, this car falls into both categories. It's very well done and very insane. This E36 has a Chevy 6.6 Liter LS2 and 6 speed Borg / Warner T56 6 speed transmission in it. Essentially this is a 3 Series with a Corvette drivetrain. The seller writes, "Yes it is fast, yes it is cool and yes it will turn around and smack you in the head if you don’t pay attention". What I really like about this car is that it looks no different from any E36 you'd see on the street. The car could use some cosmetic work, but it might be cooler to leave it as is and let people think you've just got an old E36 rat. Located in Naperville, IL, click here to see the eBay listing. 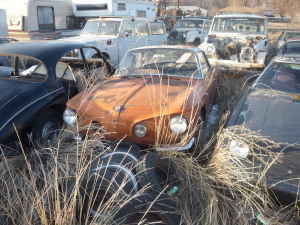 1965 Volkswagen Type 34 Karmann Ghia - This is a resoration project or a parts car. VW never imported the Type 34 Karmann Ghia. I have no idea why. It was a good looking car that was based on existing VW hardware. This car appears to be in a salvage yard. The seller only says "Needs complete restoration; has all powertrain." The "powertrain" is the least of your worries with this car. No price is given and the seller says he's "entertaining all reasonable offers". If the price really is reasonable and the car is not a complete rust bucket (and they are prone to rust), this could be a cool restoration project. Located in Longmont, CO, click here to see the Craigslist ad. For more info on the Type 34, check out the Type 34 Registry. RELIANT - I have always liked the looks of the GTE. They were a fairly common sight in GB, but I am afraid the passage of time will make them less so. The later Scimitars really lack character and resemble a cross between TVR 280 and a Ford EXP. It is possible Reliant could have had a chance federalizing the Scimitar. The Robin, on the other hand, would never have made it unless the Shriners had a powerful Congressional lobby. BAVARIA - If the rust issues are even remotely close to the CS models, then forget it. I've read far too many horror stories. It's too bad, because I've admired these cars from the day they were released. TYPE 34 - Uber cool, but what would it take to get it on the road? You can really tell that an Italian had a hand in the design. Parts of it look faintly like a Flamina. On the other hand, the rear end looks like a Corvair from certain angles. The BMW - I like the way this looks, what a sleeper. I understand your caution regarding swaps, but the listing pretty much details all of the work that went into it. But just because it's not a hillbilly conversion doesn't mean a rocket scientist had a hand in it. I wonder how many minutes it took for the owner to figure out that this car had no future at the autocross track? I'm not sure how comfortable I'd feel rubbing elbows with folks down at the dragstrip. I think the novelty would wear off after a bit.